Powerful storms brought hail, gusty winds and confirmed tornadoes to communities in the South, killing at least 9 people — including 3 children — before moving northeast and toward parts of the Midwest, Mid-Atlantic and Northeast over the weekend and into early Monday morning. The latest: The National Weather Service issued numerous severe thunderstorm and tornado warnings and watches early Monday, as a strong cold front pressed across the eastern states. Affected communities were in New York — including New York City — Virginia, Maryland, Pennsylvania, New Jersey and Connecticut. Severe thunderstorms and heavy rainfall from the Northeast to the Carolinas continued into early Monday, before giving way to fall-like weather and strong winds behind the front. Details: The storms turned deadly in Louisiana, Mississippi, Alabama and Texas, where a tornado with estimated 140 mph winds was reported in Franklin, Texas, northwest of Houston. On the cold side of the weather system, Chicago airports canceled over 1,000 flights Sunday after the storm brought heavy snow to the city. Almost 90,000 customers were without power in Texas, Mississippi, Louisiana, Georgia and Arkansas, www.poweroutage.us estimated around lunchtime Sunday, after powerful storms and twisters were reported through the night, damaging property in their wake. Mississippi Gov. Phil Bryant declared a state of emergency for affected areas Saturday evening, as the the severe weather moved through the state. 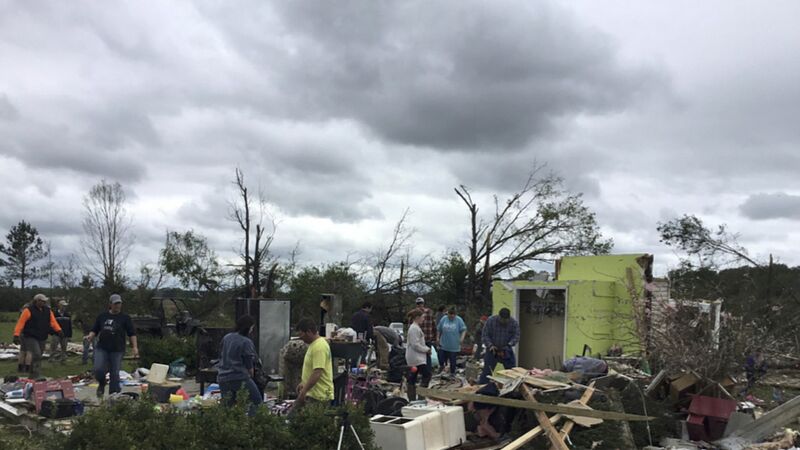 The NWS Memphis said preliminary results indicated an EF 2 tornado in Hamilton, Mississippi, with winds around 130 mph. "Still investigating another tornado track in northern Monroe Co. near Greenwood Springs MS with EF 1 damage with winds 95 to 100 mph," it said.